The Sun is shining on my face, a gentle breeze is blowing, bringing to my ears the sounds of people talking and laughing, children playing, and through it all the sweet sounds of jazz….. This is a rare moment of complete relaxation. Jazz on A Summer’s Day is the biggest jazz event in the UK, with thousands of people converging on the Ross Theatre in Princess Street Gardens to eat drink and revel in the atmosphere. 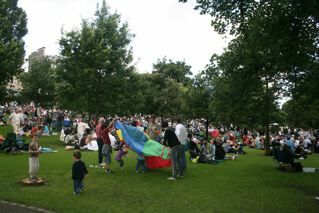 It is one of the free events of the Edinburgh Jazz and Blues Festival and a fabulous family day out. People really come prepared with sumptuous picnics, lots of booze, chairs, shade shelters and most importantly for a relaxing day out, plenty of stuff for the kids. We arrived about half an hour before the jazz began, so got a great spot on the lawn for our little picnic. (Opps we forgot the wine 🙁 oh well) The kids ran amok. D Found himself some friends to play with and we hardly saw him for the rest of the day (four years old and we’re already cramping his style) and R started dancing before the music even began! First up were the Edinburgh School’s Jazz Orchestra, followed by No Name Horses, Mike Hart’s Society Syncopators (I have never heard a clarinet sound so beautiful) and the Criterion Parade Band (these guys were heaps of fun). By this stage we had run out of food and the boys have run themselves ragged (lovely children turn into little monsters at this point), so we head towards home with a stop for ice cream of course. 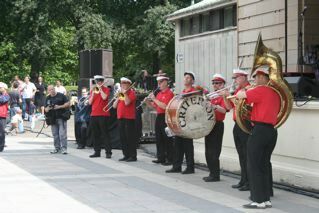 We miss the last few acts including the RAF Big Band, but all in all a fantastic day out. I am by no means a Jazz Buff, and certainly could not ‘review’ the music. The event in itself was everything I expected (would have liked some wine though!). The weather was beautiful, the atmosphere was relaxed and buzzing with a tangible festival feel. The festival runs through the first week in August and is part of The Edinburgh Festival. Individual entries range from free – around 30 pounds. This entry was posted in Events and tagged Edinburgh, Edinburgh Jazz Festival, Events, Festivals. Bookmark the permalink.